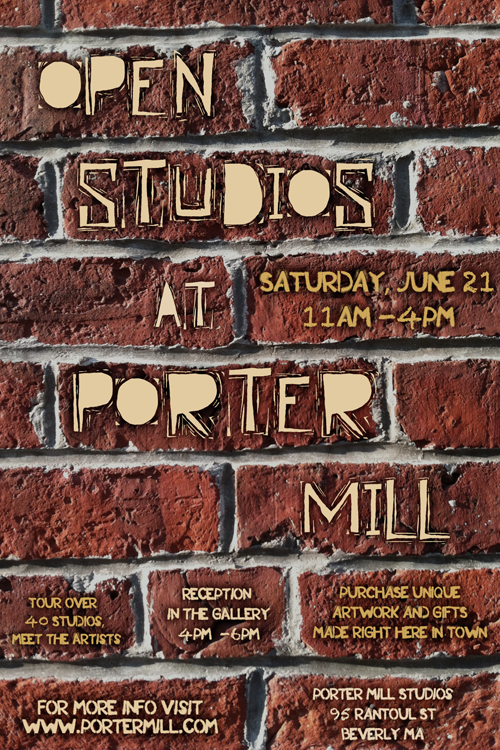 It's that time again -- join us at Porter Mill on Saturday, June 21st for our annual all-day Open Studios! From 11 AM - 4 PM, our building of 50+ artists will be opening its doors to the public. Porter Mill is home to a wide variety of talented artists, including designers, photographers, musicians, ceramists, sculptors, and more. Take advantage of this special day to meet the artists, check out their studios, and purchase unique works of art made right here in downtown Beverly. The event is free and sure to have something for everyone! After the main event, join us in the Gallery from 4:00pm – 6:00pm for a reception with music, snacks, and art!